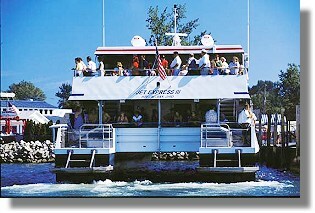 Get more bang for your vacation dollar when you ride the Jet-Express from Sandusky Ohio or Port Clinton Ohio. 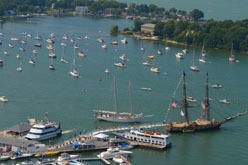 With every paid ticket, Jet-Express Passengers receive a value packed coupon sheet with savings at many of Put-in-Bay's favorite destinations. Discounts include $5.00 off golf carts and mopeds, Kids eat free in many restaurants, discounts on attractions and much much more! Click the link above to download your coupons now. 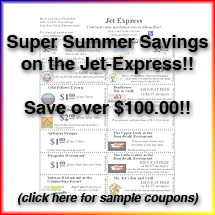 Be sure to request your money saving coupons when you purchase your Jet Express ticket or you may now purchase Jet Express tickets on-line so place your order today!! 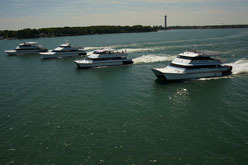 Ferry service to Put in Bay Ohio... where the Jet Express Ferry ride can be half the fun of getting to South Bass Island Put-in-Bay. 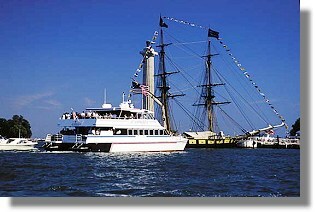 Relax and ride while enjoying a narrated tour of the history of the island. 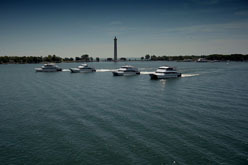 All-aluminum ocean-approved catamarans, the Jet Express are built in the USA. 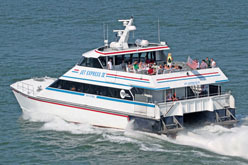 Traveling at speeds in excess of 40 mph the catamarans are among the fastest ferries in the world, yet the sleek twin hull design glides through all weather conditions with unmatched smoothness. 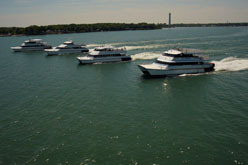 Triple deck design provides beautiful viewing from an open air observation deck or from two stylishly appointed passenger lounges with tinted windows, carpeted decks and cushioned seats. 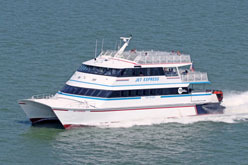 Providing Early Morning/Late Night Service to downtown Put-in-Bay, board the Jet Express for the most convenient and most comfortable transportation to the island.